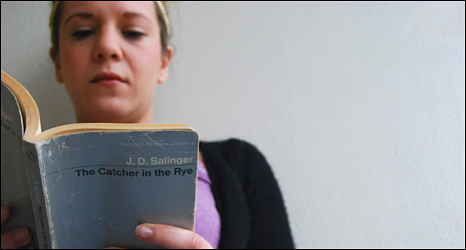 BBC News - Why does Salinger's Catcher in the Rye still resonate? Why does Salinger's Catcher in the Rye still resonate? JD Salinger has consulted his lawyers over an unauthorised "sequel" to his classic novel The Catcher in the Rye. But 58 years after the story about a disaffected teenager was published, why is it still so powerful to so many people? Holden Caulfield does not like a lot of what he encounters. Much is dopey, corny, lousy, crumby, vomity but most of all, phoney. Holden is surrounded by phoneys, almost wherever he goes. It's almost enough to make him puke. Holden is 16. Expelled from his prep school for flunking too many subjects, he travels to New York, his home town. He drinks, smokes, sees a prostitute, is punched by her pimp, goes on a date, has a strange encounter with a former teacher, spends a fair amount of time in the park, and really does not a great deal else. Mostly he ruminates on the people he meets, people he met in the past and his dead brother. Plot is in short supply. The Catcher in the Rye is a novel where not very much happens. And yet this story of a couple of days in the life of a teenager has sold tens of millions of copies since its release. There are not many other novels from the 1950s that can be found persistently hovering around the top 100 bestseller lists. Fans of the novel regard it as the defining work on what it is like to be a teenager. Holden is at various times disaffected, disgruntled, alienated, isolated, directionless, and sarcastic. The book's publication in 1951 came at the dawn of the age of the teenager. A new social category, newly economically empowered and hungry for culture, was fed by music, films and novels. William Golding's Lord of the Flies also came propitiously, in 1954. "It absolutely speaks to that moment the teenager emerges as a recognisable social group," says Dr Sarah Graham, author of Salinger's The Catcher in the Rye and a Routledge guide on the same subject. "Before that people went through their teenage years with no sense it was a particular kind of identity. It is the first novel of the modern teenage years." The fact that teenagers were all in high school for the first time, instead of working and providing for their family from an early age, gave them time to think. And to mope. "Leisure gave teenagers time to reflect on where they were going," says Dr Graham, of Leicester University. "The idea of existential angst in some way draws from Catcher in the Rye as much as the novel reflects it. There is a strong dialogue between the book and the teenage experience - they are mutually shaping." But The Catcher in the Rye wasn't written for the audience that has embraced it most wholeheartedly. "It was never written for a teenage audience, it was written for adult readers," says Dr Graham. "There's been so much controversy over the years with it being offered to high school students. From the 1950s there are cases of teachers losing their jobs for setting the book." Whatever the intended audience, Salinger's work has become a classic of one of publishing's most lucrative genres - teen fiction. And a thousand authors have tried to capture the spirit of Holden Caulfield. But despite its gazillions of sales, there are plenty of people - teenage and adult - who just cannot understand what the fuss is about. You can find a decent cross section of these critics giving the book one star on Amazon. "The moaning, dreary I-like-the-sound-of-my-own-voice tone with which Caulfield told his short story started to really get on my nerves," says one. Another concludes: "It's like reading a diary written by a spoilt, annoying, Emo teenager - self indulgent, repetitive and likely to leave you wanting to just slap the narrator while saying 'for God's sake, get over yourself'." Other brickbats from the iconoclasts include "over-rated", "lamentable", and "inane ramblings". Many of these readers are disappointed that the novel fails to meet the expectations generated by the mystique it is shrouded in. JD Salinger has done his part to enhance this mystique. That is to say, he has done nothing. 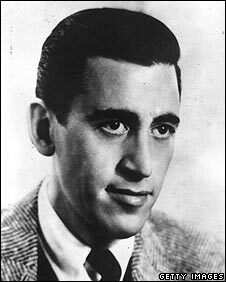 Salinger's most famous achievement is writing The Catcher in the Rye, but his second most famous achievement is several decades of seclusion. He has not published since the 1960s, nor given an interview since the early 1980s. He is a man who only reminds the world of his extant status by occasional forays into legal action against copyright infringers. There can be few works of The Catcher in the Rye's stature that have avoided a Hollywood adaptation. The notoriety of the novel is also enhanced by something far darker - that John Lennon's killer Mark David Chapman was completely obsessed by the work, and was reading it when arrested. Whatever its reputation, Salinger's novel now enjoys a status as something passed from adults to teenagers, and from teenager to teenager. Adults give it to teenagers hoping they will be reassured that having a train of misanthropic and cynical thoughts parading through their mind is entirely normal, perhaps even desirable. Those who embrace the novel recognize Holden as a teenage everyman. Dr Graham suggests it is unique, "the way in which a young affluent white male has come to stand for a universal experience of adolescence". Holden feels uncomfortable about all the things that adults have learnt to inure themselves to. Holden can't bear to see people with cheap luggage - it becomes a symbol of a society where money is all. He hates the school headmaster who will not speak to the funny-looking parents. Holden hates everything that pretends to be authentic. And what do adults re-reading it in 2009 get? Perhaps they hope to recapture something of the way they thought when they were a teenager. I read Catcher as 16-year-old in 1976 for O Level. For me, it was part of a great awakening, but that's also down to my teacher, Mike Allen. He told us to read the first chapter - but I gulped down - maybe half or more - of the book, can't remember exactly, in one sitting. I was certainly an emotionally and intellectually suppressed kid, and maybe that's why the book resonated so much with me. But Catcher and Mike Allen's teaching helped me feel that I did have a brain, and I could use it, so I owe them both a lot. I tried reading it again and it just didn't click the way it did that first time. Maybe it is overrated - but Salinger's use of skaz is certainly adept and Holden is a great anti-hero character, so the book keeps on working. The REAL issue is that this, like many other books, has been over analysed, attributed with 'hidden' meanings, compared and judged, and assigned values by a diverse range of people. It has become a myth rather than what it actually is; a well written, well structured story. A story does not have to have a lot happen in it, nor does it have to be interesting. A story is something that should be read rather than interpreted or compared with other, unrelated, things. Got to the end of it and thought I'd missed something, some piece of subtext or hint that something else was going on but being cleverly concealed. Then realised it was completely straightforward. Absolutely baffled as to why some people rate it so highly. Read it for first time a few years back - I was in my 60s. Read it because my wife read it and moaned at every page because she didn't like the narrator. So I read it to see what the fuss was about. At first I hated it because the "hero" is so unlikeable. But then I realized that he knew that he wasn't really important to his parents. They gave him affluence but not love. But the title says it all - the core of the book is his daydream about being the catcher in the rye, and saving his young brother. Lets face it, the people who don't get the Catcher are lucky as they have managed to go through life without having cause to feel dejected and isolated enough to experience the emotions that this book encapsulates. Be sure, though that there is a significant majority for who this book resonates greatly, and these people are probably not the kind to browse the BBC magazine section to alleviate the boredom of 9-5 at Barclays. I can see the book losing relevance in the "modern" world where clamouring for an extra Facebook friend is as close to an existensial crisis as most people get. Having just finished studying the novel for my GCSEs, I must say that I absolutely love it! Although I initially hated the book, I found it dull and uneventful, I grew to love it through the in-depth analysis we did in class. I think Holden is an incredibly interesting character and it gives an amazing insight into the mind of a troubled teenager, oppressed by society. It is now one of my favourite books. The point of literature of this nature is to provoke thought. It's like all character studies, complex. If you want a good story, or need entertaining read pulp. If you want a commentary on the human condition then in Catcher there is no better. This is the text that defines the 20th century along with Ulysses, and will be a point of reference for ages to come when they look back on history of what went wrong in society. For those "not getting it" and who have posted negativity- there is a strong link between your inane babble and the point of the book. We studied this and Paul Zindel's The Pigman at school. Both were brilliant and completely captivated the class, even those not usually interested in literature. Why? Because both deal directly with the issues that most teenagers encounter. The book really speaks to the confused outsiders that are Holden-like in their thoughts and behaviour.I think the people that don't "get it" are simply to well-adjusted. Also, I'm surprised they haven't mentioned Wes Anderson's "Rushmore" as being influenced by Catcher, it is the most obvious example i would have thought. I can't believe people being disappointed in the work because they find the central character unsympathetic. You're not SUPPOSED to like him, he's not in a popularity contest. Many great works of art are supposed to make you feel uncomfortable. One of the few books everyone seems to have read, and that says a lot. The first time I read 'Catcher in the Rye' I hated it. I was 17 at the time and growing up in a former pit village in the north of England. I couldn't understand why someone so privileged and with so much opportunity could be so miserable. I avoided reading it for many years. I read it maybe 10 years later and I can now class it as one of my favourites. In my opinion there's a certain irony to the work that I only understood after a certain amount of experience. I think the text is a work of genius. I read Catcher simply to see what all the fuss was about like the vast majority of others who have read it I would imagine. Frankly I really don't know what all the fuss was about.....a work of it's time seen as subversive and so gaining a reputation like any forbidden fruit. Written today it would be unlikely to even get published. I bought the book a while ago when it was hyped on a best seller programme. I have attempted to read it for the second time, and, I must tell you I am not enjoying it. Although I am a young 45 I just can't get into the flow of the book, the narrator bores me rigid, do I need to have gone through the American education system to understand any of it? It is not a book to read if you are at all suicidal, as it may push you over the edge. I apologise for using this hackneyed example, but I have to say it: it's timeless in a similar way to Shakespeare, and the use of vernacular shouldn't cloud the same thoughts and ideals we in our current day face. In fact, it helps us accept that the base of human nature is essentially the same no matter where it is dated, and this is of fear. Fear of the unknown, of the eventuality of death (sorry for being morbid). When we are young, we are made to believe that adults know everything. We mess up, they clean up after us, they teach us what is right and what is wrong. We finally realise upon reaching adulthood that the people making rules are as scared as we are. This fear can translate to what he calls being a "phoney", changing your behaviour around others because everything is not black and white anymore. Maybe Holden dost protest too much, but as a teenager who realises this veneer of calm around him melt around the edges for the first time, I don't blame him. He wants to save youth from us, just like we had it stolen from him. That's life I'm afraid, and we like reading about life. Life sells. I'm 35 and read this for the first time earlier this year. I picked it up as it was small, fit in my rucksack and I was travelling. The Catcher In The Rye was tortuous. I would agree with two of the "Why people don't like it" points in the original article - too much whining and a self-obsessed central character. I'd also add that virtually nothing actually happens. There's no plot, no story. It's outdated, but even its age can't hide how dull it is. Picking JD Salinger over, say, Anthony Horowitz is like picking Forrest Gump over The Shawshank Redemption. There weren't any teenagers before Holden Caulfield. There certainly weren't any at Pencey anyway, just crumby overgrown kids who grin too much. The moment I started to read it I was enamoured. Holden struck me as really funny for some reason but I really related to him as well. I thought of high school as a waste of my time. I felt like everyone around me considered social status to be the most important part of their lives. Everyone was essentially being "phoney" in order to achieve a higher rank among their peers - drinking and doing drugs even if they didn't particularly want to etc. A lot of old friends ditched everything they ever were to be accepted by a bunch of people who had done the same, yielding to an imaginary pressure. It took every ounce of my tolerance to even show up every day and stand up to the nonsense. It was Holden's other experiences and sensitivity that in the end made me really depressed. I read the book twice but realized it was bad for my mental health. Holden was funny and interesting but also wasn't proactive enough. I realized that in order to bear all of the things that drive us mad about the "phonies" one must take initiative to do things that make one happy and stop thinking so much about other people and what they do and think.... I'll always think it was a good book though and it was a relief to think for a moment during adolescence that I wasn't completely alone in my misery. Never read it, not interested in reading it either. If I want to hear a teenager moan, I ask my son to do the washing up! I just didn't get it. I read it in my late 20s and just got very annoyed with Holden. If I remember correctly, I kept comparing it with Mrs Dalloway, which, funnily enough, I got completely. Why? I don't know - it just seems to chime. Maybe it's time to look at it again in my late 30s - I may be a little more forgiving of teenage angst instead of getting annoyed. Maybe it's time to read Mrs Dalloway again and see if I've got rose-tinted lenses on.